The food truck craze has hit Kalamazoo. 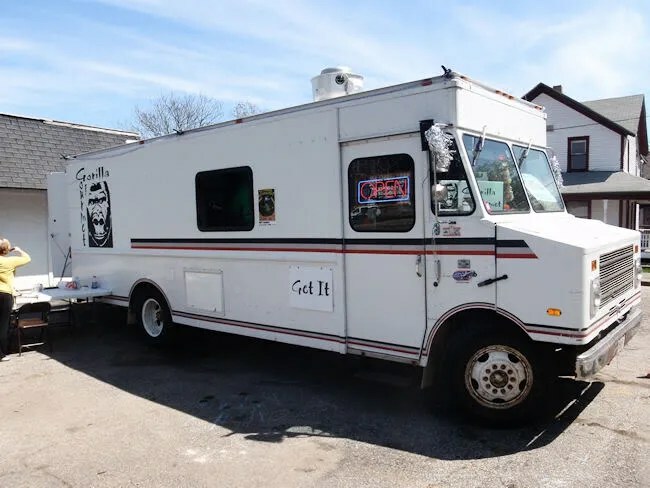 Sure, we don’t have the dozens of trucks driving around letting us know their location for the day via Twitter like some of the big cities, but Kalamazoo now has a food truck serving up the gourmet foods that people expect from this new culinary furor. I’ve been following Gorilla Gourmet on Facebook for some time. That’s odd because I hate fan pages on Facebook. I can count on one hand how many of them I actually “like,” but I’ve been intrigued with Gorilla Gourmet since last fall. At that time, they were mostly a catering truck, but they did park at the Farmer’s Market on Saturday’s. That was really the only place to get what they were serving out of the back of this truck. Within the last month, the truck has found a somewhat permanent home on Oakland Avenue just east of where Oakland meets Stadium. It takes up most of a small parking lot next to a building that looks like it may have been a restaurant at some point. It’s also right next door to the Circle K, so not only did I get great food…I got a Polar Pop…but I digress. J texted me as she was leaving work saying she wanted to go check out this food truck. We have both heard a lot of really great things about the place in the last couple weeks and we were itching to try it. We pulled into the parking lot a little after noon. It was just us and William Wood and a photographer from the Kalamazoo Gazette. They had gotten there a few minutes before we did to do an article for the Dining Out column. The menu changes every day. In fact, the menu wasn’t even finalized yet when we got there. There was a guy sitting at the table writing on the dry erase board that they to advertise the day’s selections. We are both huge pulled pork fans and we have heard so much about it, so that’s what we were looking forward to…..only it wasn’t on the menu today, so we had to try something else. 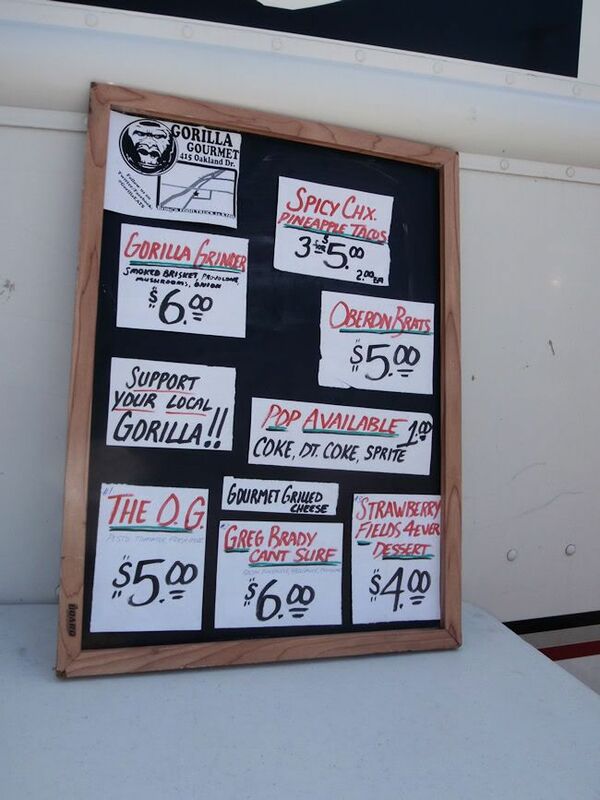 The sandwich on the menu that really jumped out at me was the Gorilla Grinder. 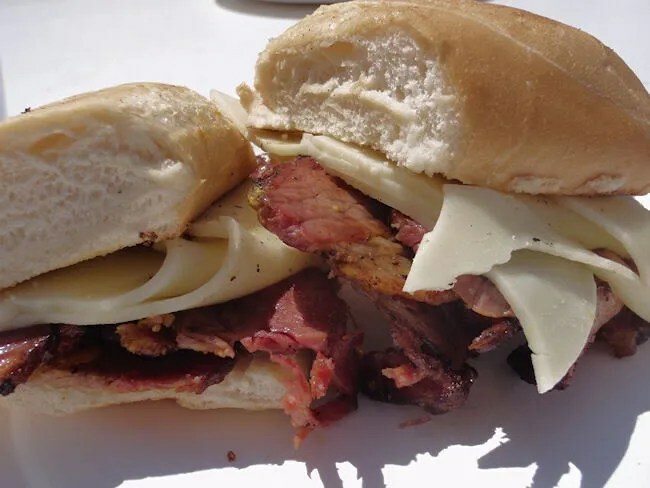 They take their smoked brisket and top it with provolone cheese, onions, and mushrooms. It’s served on a sub bun with yellow ballpark mustard. I asked to leave the mushrooms and onions off and they were happy to do so although they did ask a couple times if I was really sure I didn’t want them on there. I’m sure they would have been delicious, but I’m not a fan of either. The brisket was very tender. Very tender and delicious. I do feel kind of bad about not eating the sandwich the way it was intended, but I really just wanted the meat. Any smoked meat is good meat in my book and this brisket was outstanding. J picked out one of the Gourmet Grilled Cheese sandwiches. They come up with cute names for all of their selections and the one she chose resonates more with the older crowd than the chic college crowd. It was called Greg Brady Can’t Surf…you know, after that Brady Bunch episode where they go to Hawaii and Greg finds the tiki idol, etc. 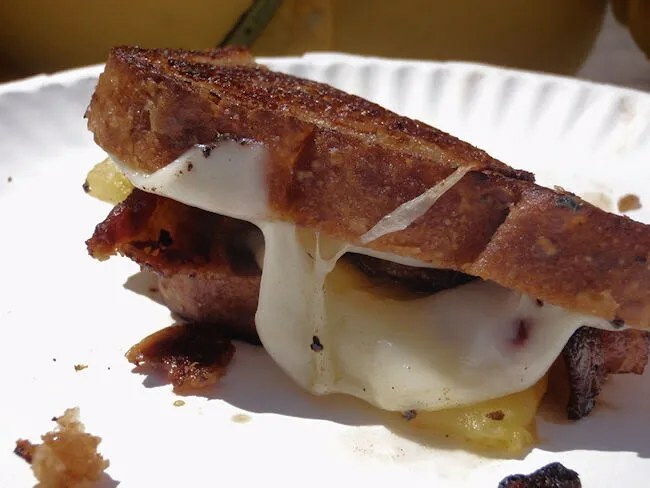 Anyway, the sandwich is provolone cheese with bacon, pineapple, and BBQ sauce on very darkly toasted, but nowhere near burnt bread. J absolutely loved it. After we left, she called it the best sandwich she’s had in a long time and was already asking when we were going back. In a turn of events that almost never happens, J actually finished her sandwich before I did. Yeah, it was that good. The damage for the two sandwiches was twelve bucks even. The food? Amazing. I really can’t wait to try everything on their menu….most importantly, I can’t wait to try the pulled pork. I think J may drive by there everyday until she notices it on the menu. 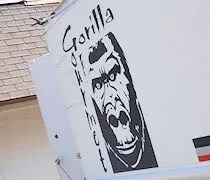 Gorilla Gourmet sets the bar high for food trucks in Kalamazoo. As of now, they’re the only ones and even though they can’t drive around and set up shop where ever they want like they do in the bigger cities, they still bring that culture to Southwest Michigan.